Survivor Diet Challenge: Day 32 - MEGABURGER! As you may or may not know, my reward for surviving past week 4 is a big juicy hamburger with the works. I've been thinking about this since Monday - trying to figure out the best place to go for my "best burger ever!" I've had some really good ones close by - Ichabods, Zacharys, Barnacle Bills, The Pour House, Where's the Beef, Mudville Pub, KJ's, etc. All top notch by burger standards. But how was I going to top them all? Hmmm, where to go indeed? And then it hit me. . . It was simple - I was the answer to my own question. Who could construct a better burger with everything I love on top and all around it? Nobody. It doesn't exist - except for in my own mind. So I was the logical choice to make. . . MEGABURGER! Little did I know at the time that this little project of mine would consume an incredible amount of my time and resources. So much in fact that I'm still trying to compile the photo montage of my exploits. Here's a little teaser photo of my creation with a much more detailed explanation to follow. So check back soon to the megaburger post. You won't want to miss this. 2 Days later. . . The bread - Aleo's Italian Deli has these long hard rolls that are amazing. What could be better? And I found one that was square-ish shaped. Perfect for megaburger. I sliced it open, extracted most of the inside, sauteed the inner bun in butter and then tossed it on the grill for some marks and some flavor. The beef - Originally I was shooting for an 80/20 mix for the perfect burger fat content. However, the quality of the beef is also important. I went to Whole Foods because I knew I wanted to get Cave Aged Gruyere cheese (more on that later) and in the butcher section I found grass fed beef. Yes it cost about double, and it was 85/15 but this was megaburger and worth a little extra. To compensate for the lack of fattiness, I also got a half pound of ground lamb to mix in with the ground beef. A perfect combination. I gently mixed in some extra virgin olive oil, kosher salt and fresh ground pepper into the beef/lamb blend. I had enough for megaburger and 2 extra patties for the kids. 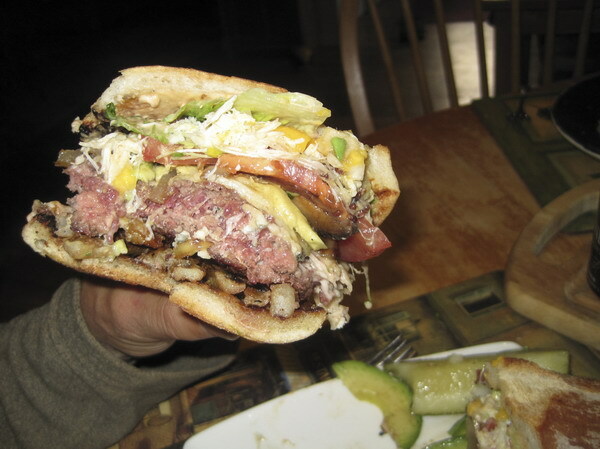 Cheeses - Megaburger is stuffed internally with a big chunk of blue cheese. Then, at the end of cooking I sliced a slab of the Gruyere and melted that over the top. Did I mention it was cave aged? The Works - Caramelized sweet yellow onion, sauteed portabella mushroom slices, sliced avocado, sprouts, a beauty of a slice of tomato, a scoop of chutney (consisting of yellow mango, lump crab meat, diced onion, avocado and tomato with kosher salt), romaine lettuce and special sauce (a blend of mayonnaise, ketchup, Worcestershire sauce and Grey Poupon mustard). The Sides - The perfect fries. These, I did not have the desire to make when I knew a trip to 5 Guys was all I needed to do. They slice their potatoes on site and deep fry them not once, but twice to give them the perfect crispiness. The home made equivalent just wouldn't do justice. I also grabbed some ketchup and malt vinegar while I was there. A side Caesar salad and a fresh sliced deli pickle rounded out the sides. (A layer of fries went between the bottom bun and burger as well). The Beverage - Wow, this was a no brainer. What is the perfect beverage to go with a megaburger? A Guinness, of course. A match made in heaven. Well there you have it. No ordinary burger. I have to admit, I didn't finish it all in one shot. I needed a couple breaks along the way. But as my friend Adam Richman (from Man v Food) would say, "In this epic battle of Man versus Food, today. . . Man was victorious!"